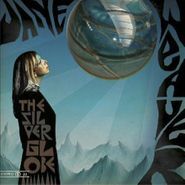 Brit singer/songwriter Jane Weaver pulls from a basket of tricks left behind by Silver Apples and Hawkwind on her new cosmic folk-pop album, The Silver Globe. The album takes it’s name and is inspired by Polish director Andrzej ?u?awski's film On The Silver Globe, which should give one an idea of the sort-of 1970’s krautrock/soundtrack-vibe contained within. Weaver’s pretty and air-light voice floats above the fuzzy synths and rumbling bass, producing some wonderful earworms.